The Turkish karate trio of Haldun Alagas, Bahattin Kandaz and Sait Ucan first visited South Africa in 2010 to present its week long training camp. The goal behind these training camps are to expose our athletes to the coaching of these top coaches in order to prepare them to reach their goals. The Turkish coaches are brilliant in movement and agility and their fighting combination is advanced. Since 2010 Sensei Eugene Oosthuizen have not missed a single training camp hosted by Sensei Haldun Alagas. Sensei Haldun Alagas is a Turkish karateka who is a multiple World and European champion. 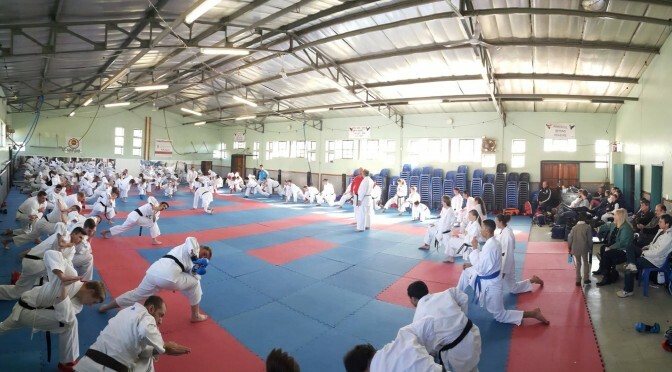 On Saturday, 18 July 2015 Sensei Eugene Oosthuizen, together with Sensei Morgan Moss invited the Turkish karate trio to present a training session to juniors and seniors at the Solis Ortus dojo in Garsfontein. Karatekas from all over Gauteng attended this training session. Some found it so informative that they participated in both senior and junior sessions. This is testament to the fact that our athletes are hungry to learn and willing to work hard. We all enjoy receiving the world knowledge of our Seniors, Mentors and Champions. It is always a privilege when we have them on South African soil and they are willing to share their knowledge with us. On the day of the training sessions it was clear that all who arrived for the session was very excited to start and to learn. The hall was packed and soon it became very hot inside on a chilly winter’s day. Karatekas were split up into lines and groups to make movements easier. All over you could see the concentration on each and every person’s face, each one trying their best to master a technique and do the best they can. It is wonderful to see young and old put in all their effort because they love their sport so much. The karate community is a strong one, and we are all connected and united in the sport. It makes our Sensei very proud to share moments such as this one with so many athlete and he looks forward to sharing many more such moments with you all.